AUSTRALIA HAS A huge fixation on Big Things. There are the famous ones, like the Big Pineapple on the Sunshine Coast and the Big Banana at Coffs Harbour. But there are hundreds of others, and we always include some in our travels. Here are five of our favourite little-known Big Things, with something to offer caravanners. Latrobe prides itself in being the platypus capital of the world. Several other Australian towns make similar claims, but Latrobe really is world famous for its platypuses (or is that platypi?). Film crews come to Latrobe from all over the world to get footage of them. Outside the Australian Axemans Hall of Fame in Bells Parade, you'll find the Big Platypus. There is plenty of parking, a Platypus Interpretation Centre inside, and you can even book a platypus viewing tour. Best of all, across the road is the new Latrobe Mersey River Caravan Park. 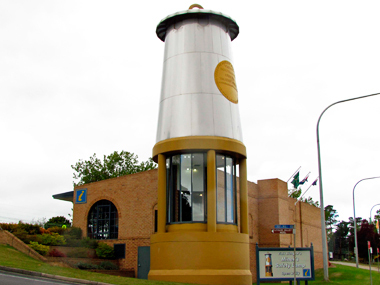 This unusual Big Thing is right on the Great Western Highway in Lithgow. You mightn't notice it at first, since it is actually a tower built into the Lithgow Visitors Centre. Coal mining has been an important industry in Lithgow since the 19th century, and the invention of the miner's safety lamp helped to make life much safer for coal miners. The Visitors Centre has heaps of information about Lithgow and nearby tourist attractions. There is parking for cars across the road behind the centre, and parking for larger rigs at the western end of the parking area. The Big Pelican is on the banks of the Murray River at Loxton. This amusing bird has a fish in its beak and a fence around the base, perhaps to prevent it from escaping when no-one is watching. 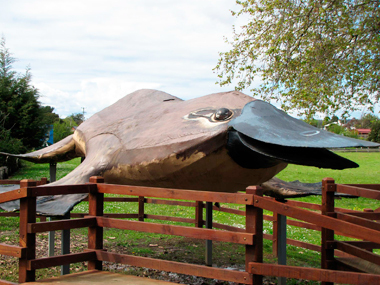 It is located right next to the Loxton Riverfront Caravan Park, so you can camp within eyesight of the Big Bird. 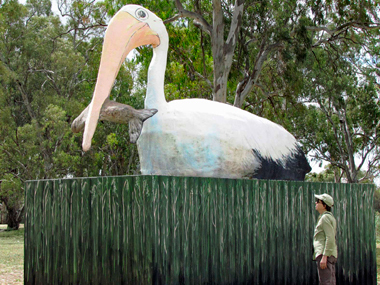 The Big Pelican was originally a papier maché figure which floated along the Murray River on top of a houseboat. It was used as a float in the 1980 Loxton Mardi Gras, then renovated in 1985 for the Adelaide New Year’s Eve celebrations, and finally reconstructed in fibreglass in 1998. There must be something about big birds and tourist information centres. 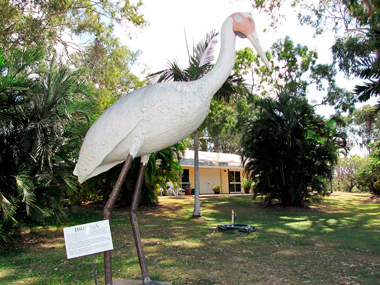 Outside the Townsville Southern Highway Information Centre on the Bruce Highway, south of Townsville, there is a Big Brolga. As well as tourist information, this tourist centre has ample parking for caravans and motorhomes, plus a picnic area and even showers. It makes for a great RV stopover. Australia has not one but two Big Sheep. 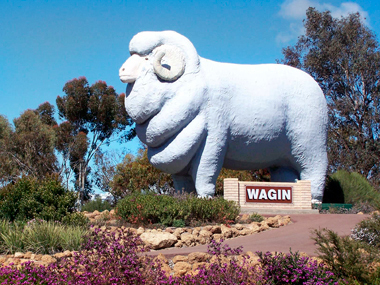 In addition to the Big Merino in Goulburn, there is a Giant Ram in Wagin, in the southwest of WA. Made of steel and fibreglass, the Giant Ram stands 9m tall and weighs 4 tonnes. The Ram stands proudly on a small hillock in a wetlands park on the western entry into the town, surrounded by a garden filled with wildflowers. The park has plenty of parking, plus covered barbecue/picnic facilities. Susan and Keith Hall are regular contributors to Caravan World.